Dabang Delhi came from behind to beat Bengaluru Bulls 38-30 and log their second consecutive win in a Inter Zone challenge of the Pro-Kabaddi League (PKL) at the Netaji Subhas Chandra Bose Indoor Stadium on Wednesday.In what was a see-saw battle from start to finish, Bengaluru threw away their halftime lead of 18-12 as Delhi rode their captain Meraj Sheykh's superlative show to register their fourth win in the tournament in nine games. 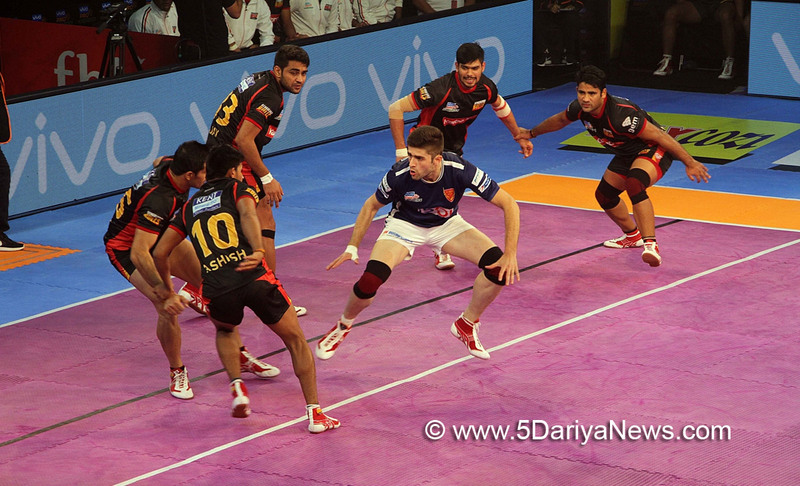 Delhi are now on 24 points.Bengaluru remained fourth with 23 points from 11 outings.For Bengaluru, Rohit Kumar (13 raid points) fought well but in the end his efforts went in vain.Delhi got off to a bright start, opening up a 6-1 lead, on the raids of their Iranian duo of skipper Sheykh (14 raid points) and Abolfazl Maghsodlou's (8 raid points).But Bengaluru came back strongly, effecting an all out effort to widen the gap to 13-8 from 7-9. At the halfway mark, Bengaluru were leading 18-12.In the second half, the complexion of the match changed as Delhi came back to return the favour of an all out, levelling proceedings at 23-23 with the tie more than ten minutes to go.Delhi all but sealed their win with a second all out to widen the gap to 33-25 from 29-25. From there on, it was Delhi all the way.